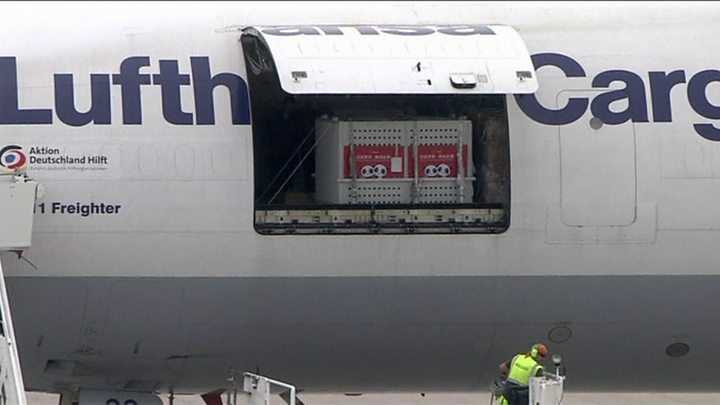 Two giant pandas have landed safely in Berlin accompanied by Chinese panda specialists and a ton of bamboo. Meng Meng and Jiao Qing were welcomed at Berlin's Schoenefeld airport by Berlin's mayor, China's ambassador to Germany and crowds of reporters. The pair, flown in from China on a Lufthansa cargo plane, were immediately driven to Berlin zoo. They will be introduced to the public next week by Chancellor Angela Merkel and Chinese President Xi Jinping. "They slept a bit, munched on their bamboo and nibbled on some cookies," veterinarian Andreas Ochs told reporters at Berlin's Schoenefeld airport shortly after their eagerly anticipated arrival. The bears will be officially presented to the public at Berlin zoo on 6 July. China, famed for its "panda diplomacy", has been selective in dispatching its national treasure, with about a dozen countries receiving the bears as a symbol of close relations. "The Chinese see the pandas as Chinese brand ambassadors," said Bernhard Bartsch from the Bertelsmann Foundation, a think-tank in Berlin, adding: "The pandas will lend a very positive spin in German media to the visit by [China's President] Xi Jinping in July."